Reusing water can be really simple, but that’s not the way the Department of Water and Power (DWP) sees it. 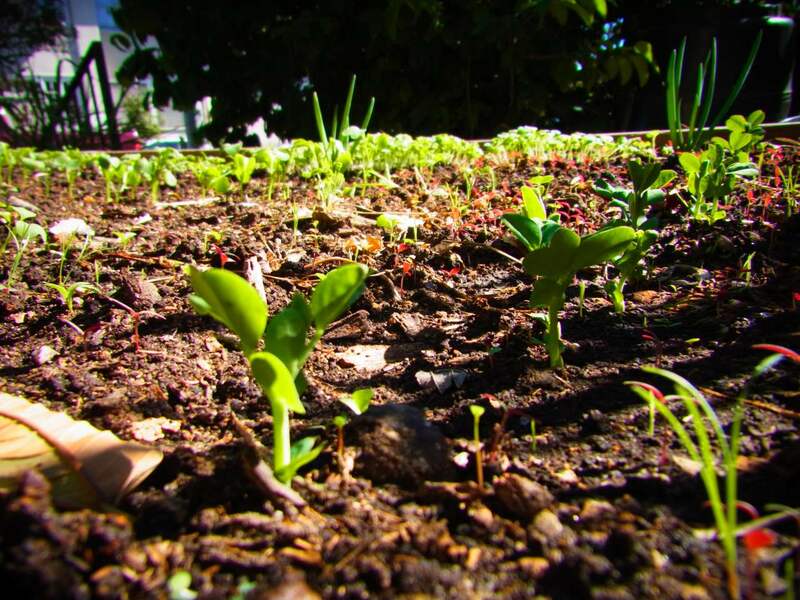 This article on the L.A Weekly features several comments by one of our members Laura Allen who is a cofounder of greywateraction.org and the writer of The Water-Wise Home, check it out. This is a really cool feature on CBS featuring Laura Allen from GreyWaterAction.org, follow this link for a video and a short article. When you think of toilet water, you don’t necessarily associate it with clean hands, but the water flowing into the tank is not the same as the water sitting in your bowl. It’s much cleaner. In fact, it’s the same water that flows out of your sink faucets. So why not make use of this water before it gets dirty? In Japan, most toilets are equipped with water saving features such as a little flush/big flush options and toilet lid sinks. This allows clean water to flow through a faucet before it fills your tank for your next flush. Here in the states, you can buy a toilet lid sink, which is fairly pricey, or you can make one yourself for a small fraction of the cost. 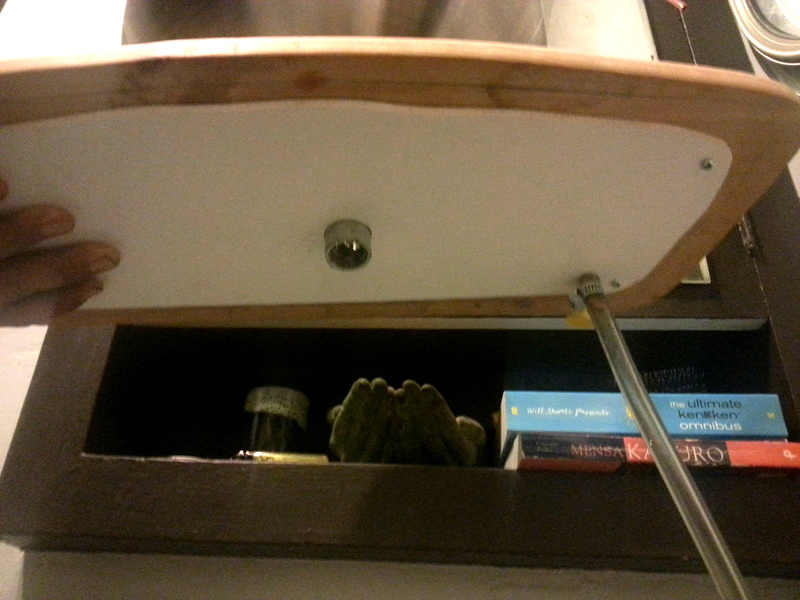 Here’s one that federico made with repurposed materials (see photo). The Materials. We found the bowl at a local thrift store for $3.99. The wood for the lid was from a discarded piece of furniture donated by our friend Josh. The copper was harvested from an old broken refrigerator. We lined the bottom with rocks I had saved from an old lucky bamboo pot. The other parts (1/4″ plastic tubing, rubber rings, short pipe piece) were lying around from other projects. You can buy all of these parts fairly easily. Because federico is pretty crafty, he didn’t follow any particular instructions to make this, but I did find a helpful how-to on Instructables here if you want to make your own. Here are a few photos of the building process. Federico drilled a hole at the bottom of the metal bowl and attached a short pipe. He cut a piece of wood into the same shape as the original lid, and attached a piece of plastic to hold the lid in place. He drilled 2 holes in the lid — one for the copper tube which serves as the faucet and the other in which to nest the metal washbasin’s drain. Here’s the inside of the toilet tank. Federico detached the beige tube that directed the incoming water into filling the bowl. He then attached a 1/4″ tube to divert the clean water and attached the other end of the tube to the copper faucet. And here’s a video of the water saving device in action. Happy flushing! 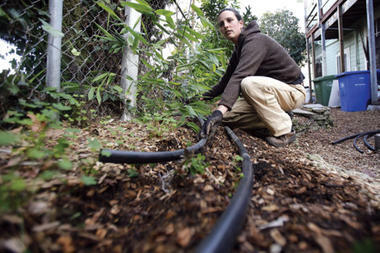 Coming October 2011, Greywater Action are back! 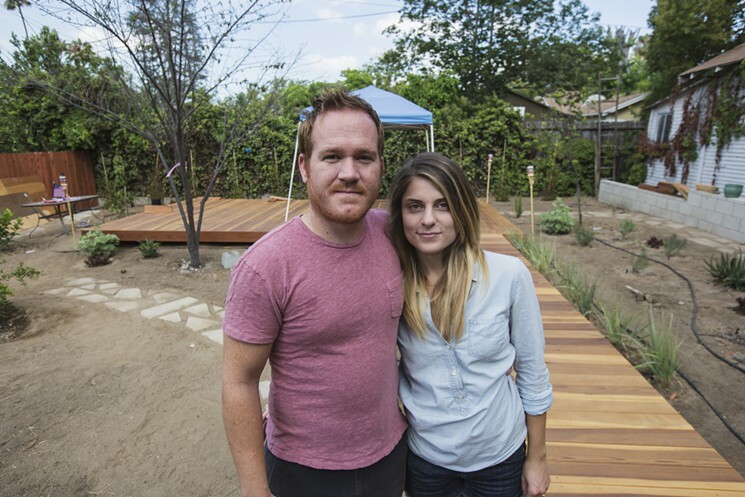 They’ll be teaching workshops at L.A. Eco-Village and elsewhere in Southern California. Greywater Action are the great folks formerly known as Greywater Guerillas, then they changed their names after the state of California went and made greywater legal. These are the folks who installed (and taught how to install) my home washing machine greywater system that I wrote about here. On this day, Laura Allen, cofounder of Greywater Action, a group that encourages conserving and reusing household water, is in her fourth of a five-day workshop teaching Californians how to reclaim and recycle what has been dubbed “gray water.” Typically, gray water includes the discharge from washing machines, sinks, showers, and tubs, which is then used to provide moisture for outdoor plants, from backyard rosebushes to large orchards. While progress has been made – many institutions, corporations, and municipalities around the world use gray water – activists say there’s still a long way to go. And it’s groups such as Greywater Action that are helping to drive change. 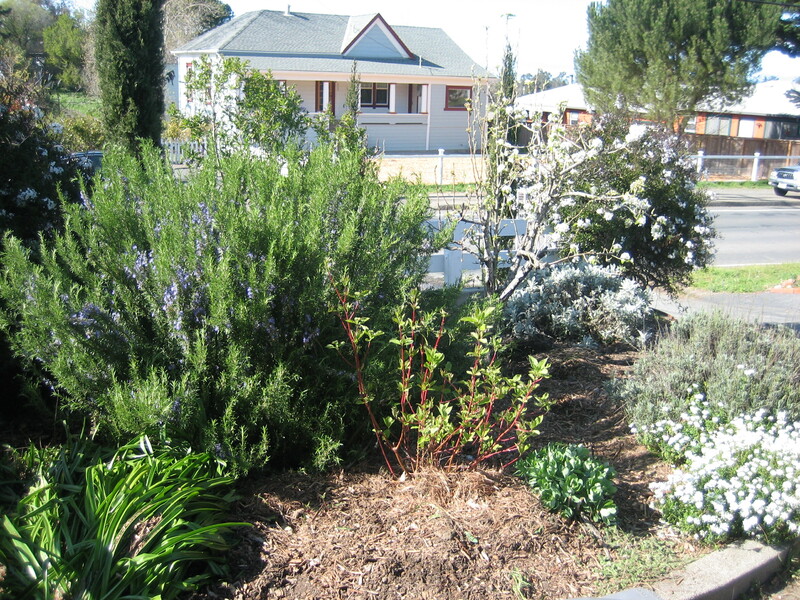 For earlier ecovillage greywater coverage see this article and these videos.